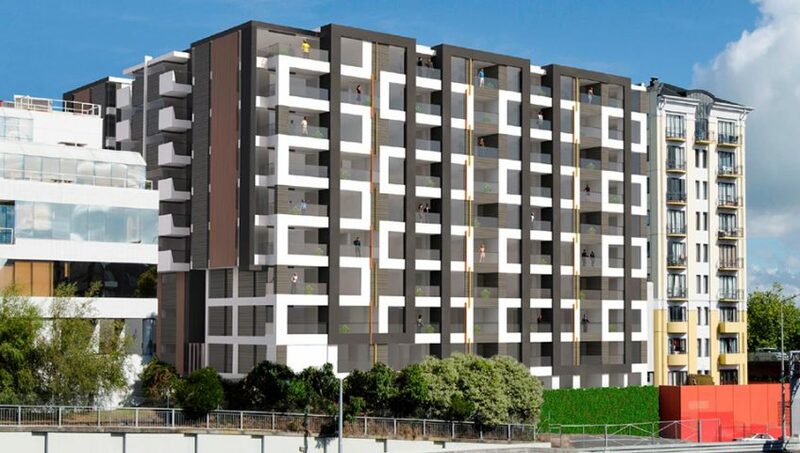 Currently under construction, Urba Residences are one of the most awaited developments to be brought to the City of Auckland, located only 3 minutes from Ponsonby Road. Beautifully designed by award winning architects, Leuschke Group Ltd to meticulous detail for the owner occupier. A 10 storey high rise with 143 apartments, which are predominantly 55m2 with 8 ‘sky terraces’ at the top of the building that are two bedrooms and 70m2. Most apartments offer stunning views overlooking Auckland’s enchanting skyline and the development also has a spacious courtyard, gymnasium and large heated swimming pool for the residents. With a big emphasis on sustainability, our Timber Consultants worked in conjunction with our local Approved Reseller to come up with a solution out of our Kingfisher SG8 range for a specific structural application in the high rise building. This multi-unit residential, office and retail building was a $180m development undertaken by Willis Bond and Co. The recently completed project was at the time one of New Zealand’s largest commercial projects. In comprises of 76 premium apartments on the upper levels, public spaces, art works and hospitality businesses at wharf level. Designed by Athfield Architects, the complex replaces the Overseas Passenger Terminal, built in the 1960s on a wharf that dates from 1910. The development was the largest private development in New Zealand and was officially reopened on 18 June 2014, by Her Worship the Mayor, Celia Wade-Brown, following six years of intense planning and two and a half years of strengthening, conservation and construction. A project of immense scale, the 250m long building has involved more than 1,000 workers over the past two years, with an additional 300 consultants, designers and experts collaborating on the project off-site. 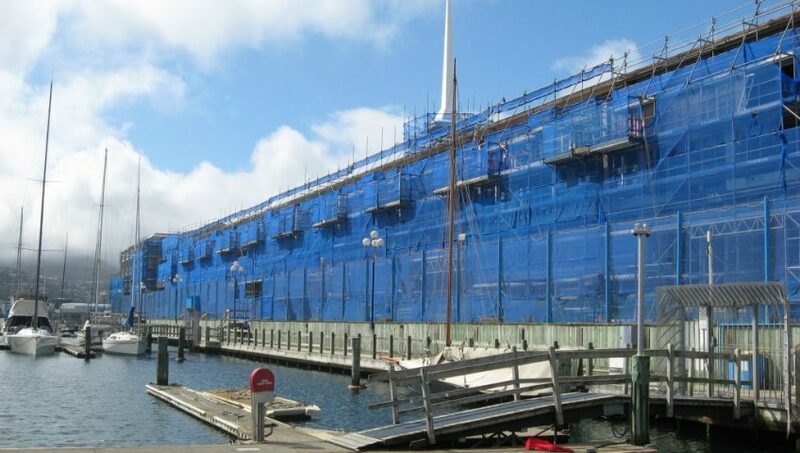 The team engaged cutting-edge construction and design techniques to deliver the international-standard development in its unique position in Wellington Harbour in excess of 100% of the Building Code. The project was constructed by local firm LT McGuiness. The apartments are the home to the city’s biggest concentration of millionaire’s and the most expensive apartment is believed to have sold for in excess of $10m. Seventy-six apartments ranging in price from $1.3 million to as much as $10m for the largest apartment on the top deck at the northern end of the wharf. Panoramic views of the city and harbour. Under-wharf parking with direct lift access to apartments. A concierge, movie theatre, gym and business centre. ATS Timber worked in close conjunction with a Wellington based Approved Reseller and contractors to supply over 11,000 lineal metres of a custom run skirting out of our Kakapo Clears Radiata Pine UT range, supplied sanded one face. This product was fitted out throughout most of the project and painted with a high gloss paint. We also supplied a number of other products involved in the structural side including timber for concrete formwork and other custom timber products to help make this exciting project a reality. 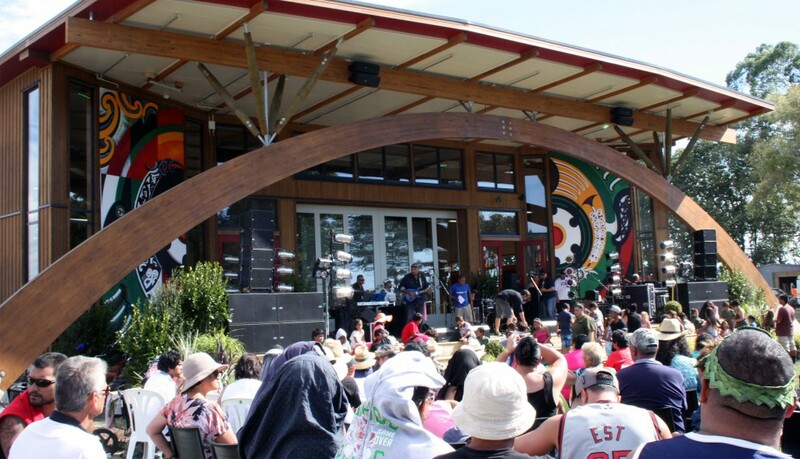 Te Wharehou o Tūhoe, the new Tūhoe headquarters in Taneatua, near Whakatane, has been designed to have no environmental impact, be integrated into its surrounding landscape and to give back to the world around it. One of New Zealand’s most advanced sustainable buildings, Te Uru Taumatua (The Tuhoe Building) used specialised Kingfisher SG8™ products with our new CQ H3.2 treatment which is chrome and arsenic free. This is an innovative new treatment system that is free of chrome andarsenic and offers superior durability to other dry treatment processes. Chosen for its structural properties, visual appearance and sustainability the Kingfisher SG8™ is proving to be a top performer in its field. This extraordinary project for the Tuhoe iwi’s new $15 million headquarters near Whakatane, was built to comply with Living Building Institutes ‘Living Building’ stringent criteria. A restorative building, the headquarters will not only reduce its impact on its local surroundings, it will actually give back. Requiring a building that is triple net zero (water, waste and energy), and whose built elements adhere to strict toxicity parameters, the Living Building Challenge is formidable. The custom produced Kingfisher SG8™ were installed as part of the solar panel structure that covers the entire roof generating enough power to sell the excess to the grid. ‘This building is a lighthouse in a world awash with climate change and social inequality, it shows the way to a different future, where we value people and a healthy environment which supports life and the economy, not one at the expense of the other” says Jerome Partington, Jasmax Architects. Please click here for more Kingfisher SG8™ detail or enquire today. Ryman Healthcare’s 26th village – Charles Flemming in Waikanae is still in construction at the time of writing this article. This $100m in Parata St, Waikanaw is named after former Nga Manu Nature Reserve trustee and renowned naturalist Charles Flemming. The resort-style facilities will include an all-weather bowling green and a village centre with a heated indoor swimming pool and spa, gymnasium, internal atrium, beauty and hairdressing salon, library and internet services, dining room, bar, lounges, shop and even a movie theatre! Ryman is one of New Zealand’s largest public companies with a market capitalisation of more than $3 billion, 7000 residents, 25 villages and 3500 staff. All painted white, the timber work on the exterior is a stunning focal point that stands out against the 3 storey brick building and an excellent area for the elderly residents to pass their time away in the sunshine. The site was occupied by an existing two storey structural unsound concrete and timber frame toilet block and under used soccer club above which was demolished. The new toilet block in Eastbourne is located in an active precinct incorporating the local pool, yacht club, scout hall, playing fields, wharf, library and village. The brief from Hutt City Council was to construct an economic new toilet block utilising the pre-fabricated toilet system by Exeloo. The new structure also needed to encapsulate an existing concrete pump room. The concept was to wrap the pump room and the Exeloo units within a simple, light weight timber structure utilising a series of laminated timber portals supporting the roof and Saligna timber batten screen. The timber portals are separated out from the building to offer a legible structure overlaid with the carefully setout timber screen battens. Above the battens pull back to reveal a lantern top which illuminates the structure at night, and appears as a lantern. The timber screen will eventually weather with effects of wind, rain and sea, enhancing this small structure. Situated in the heart of Rangitikei, near Palmerston North, this wedding and function centre is one-of-a-kind. With its world class facilities, team building activities and picturesque backdrop Orlando Country Estate is a renowned destination for your next function or corporate event. A beautiful property with rolling hills, native bush and stunning views from mountain to sea – Orlando Country Estate is ideal for corporate events and retreats. They offer a range of activities, from jet boating and helicopter rides, to golf and clay bird shooting. Recent developments at the complex involved building a new chapel to facilitate the weddings held there. Owners Gus & Sarah Lourie, worked with their local timber merchant who chose ATS Timber to become involved in the supply. A traditional rustic look with rough sawn face board & batten exterior cladding matches in well to the existing function buildings on the property. Upon going inside you will be amazed with the beautiful and extensive use of timber on the interior. Band sawn, custom made, exposed trusses grace the open ceiling structure. Walls and ceilings are also clad in ex 150 x 25 Kakapo Dress Grade Radiata Pine boards to achieve a nice knotty character. These boards were custom machined with planed 1 face and 2 edges to ensure a consistent width and thickness that made instillation a lot easier. To tie it all together, custom made rustic doors and chapel windows are surrounded by wide, chunky, band sawn timbers in a rustic style. A very tastefully designed and well thought out project that works in perfect harmony with the venue and customers they service. 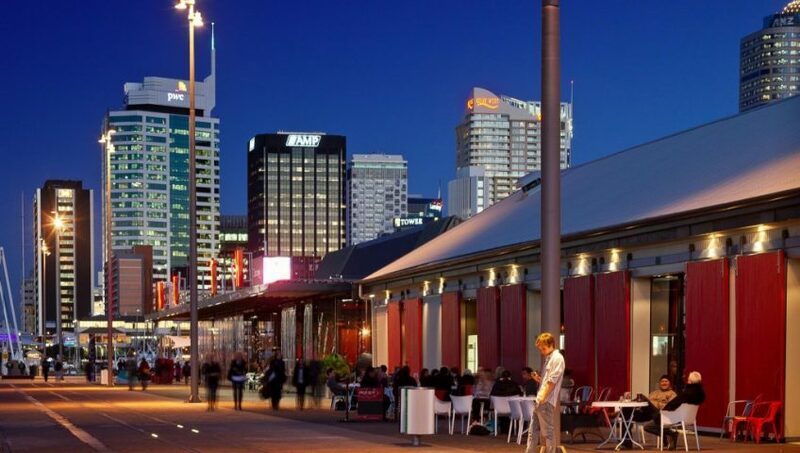 With 10 eateries and bars serving up an eclectic mix of international cuisine, craft beers, tapas and all day sun, alongside the action of a working wharf, North Wharf is a priority destination during any visit to Wynyard Quarter. While a great spot to enjoy a bite to eat or drink, the buildings that house the restaurants and cafes have a great story to tell. Designed by Architects Fearon Hay the inspiration for the “North Wharf” cluster was the Old Red Shed on North Wharf with its distinctive red doors. The shed was previously an Auckland Harbour Board building dating back to the 1930s. Originally the cargo shed stored goods as they were unloaded from boats moored at North Wharf before being dispatched onto trucks or trains, the tracks which can still been seen on the wharf. The red doors provided inspiration for the two buildings established either side, forming the “North Wharf” cluster. ATS Timber’s Kakapo Clears were custom machined to a TGV profile to meet architectural specs and required length spreads. Our Timber Consultants worked in conjunction with the contractor and our Approved Reseller to come up with this specialised solution for this high profile project. The building’s weathered, original timber frame has been retained, as well as the original cladding, which is visible from inside. Fearon Hay Architects have used pallet timber on part of the exterior walls of the two buildings on either side of the Old Red Shed to reflect the industrial look and enhance the character of the North Wharf working waterfront. This prime location in Wellington’s fastest growing residential area has been developed in two stages into a modern, state-of-the-art shopping and community village that has become the new heart of the suburb. The retail complex includes a large New World and a range of small retail stores in fashion, takeaway, health & beauty, cafe’s, marketing and a community centre. The village features five distinct buildings across the 1.4 hectare site with a spectacular supermarket, 15 shops, a community centre and various second level office facilities. The ground level also accommodates bulk storage, an entry court, extensive new roading, car parking and landscaping. 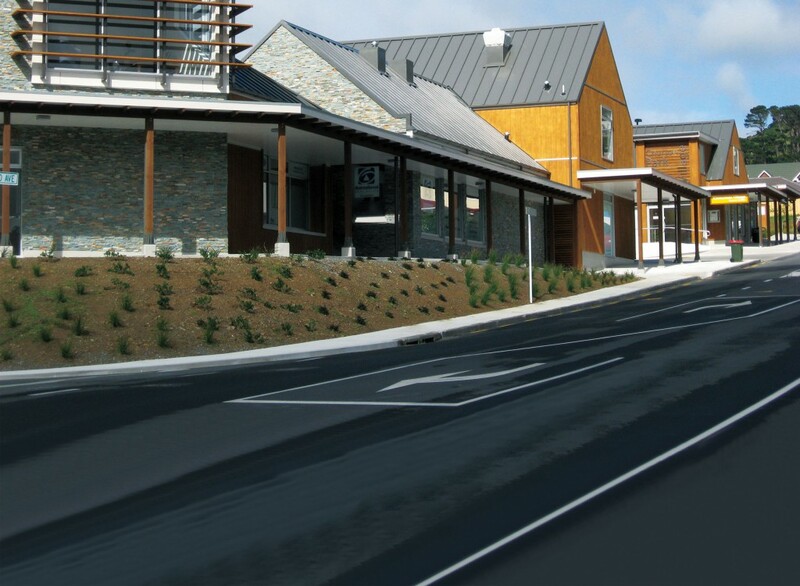 The village provides a commercial heart for Churton Park and complements the high standard of homes in the area.The first building was the 2500m2 New World Supermarket followed by two further buildings (A&B) providing a 1500m2 retail village. ATS Timber was a key supplier to the exposed timber work that was used extensively on the exterior design of the complex. All finished in bandsawn four face with exposed rafters, feature posts, fascias and battens. Our of H3.2 KD Radiata Pine, this project was custom manufactured to specific sizes and lengths to meet this architectural design. Our timber consultants worked closely with the Approved Reseller and construction contractors, Armstrong Downes to meet the specific design requirements over the two stages of development. The Tannery is a boutique shopping emporium on the banks of the Heathcote River in Woolston, Christchurch, New Zealand. The old industrial precinct is now home to an eclectic group of artisans in their own rights: a hub of creativity and hospitality, retail and craft. Founder Alasdair Cassels purchased the historic Tannery, next to the Heathcote River, in the 1994 looking for an opportunity to develop it to reflect the significance of the location and preserve and promote the history of the place Maori lived and the English settlers navigated in the 1840s. With the 2010 earthquake and a relaxation of planning issues the opportunity emerged and The Tannery was born. Starting with The Brewery and a commitment to craft and quality, Cassels & Sons Beer was born. The entire building was wrecked in February 2011, but Alasdair, Zak and Joe and families committed to rebuild and create The Tannery we see now. Now The Tannery is a destination discovered by locals and tourists with 57 retailers and over 65 resident businesses. 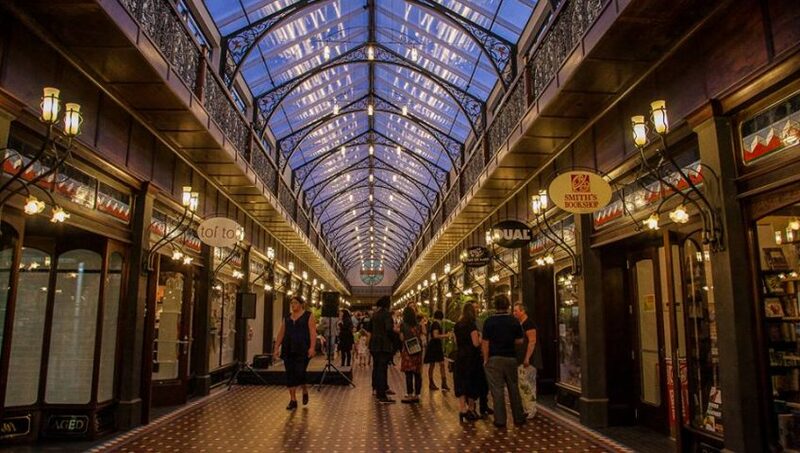 High and casual fashion, books, quality arts and crafts, gifts and homewares, personal services and fine dining all operate successfully in the bustling space nestled beside the Port Hills. 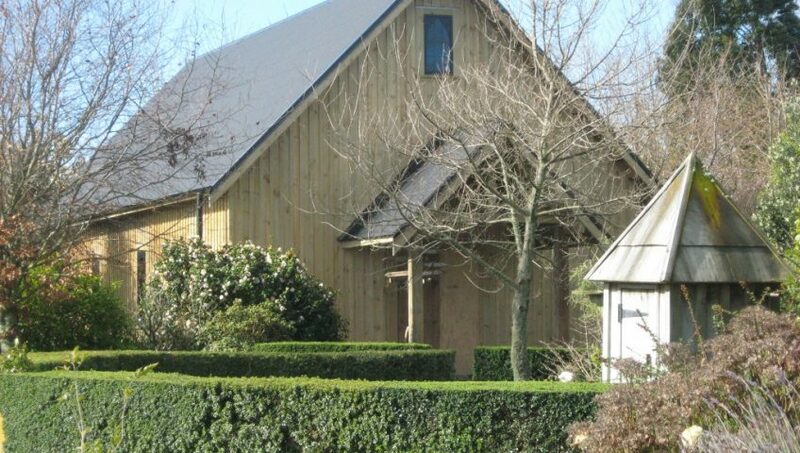 ATS Timber Consultants worked with one of our Christchurch based Approved Reseller and supplied 1000’s of metres of a custom run TGV sarking product out of Douglas Fir with a special band sawn face. 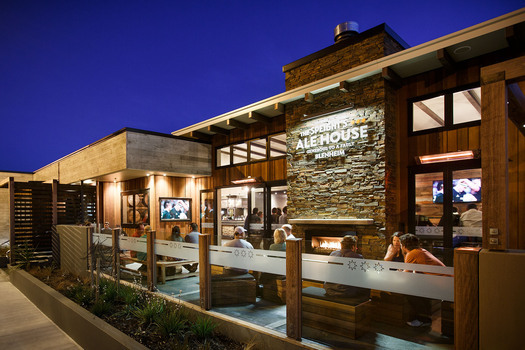 This project is sited on the main road of Springlands, Blenheim and is a custom designed commercial building that is home to the Speight’s Ale House. Designed to offer maximum flexibility and provide a variety of separate outdoor seating, the project was completed in September this year. This $750,000+ build incorporated a large about of specialised timber products supplied by ATS Timber. Traditional, rustic design includes are large amount of exposed timber products and schist stone, it matches in well with the network of Speight’s Ale Houses throughout the country. All timber we supplied was custom manufactured with a band sawn face to meet the rustic look required. Outside bandsawn Macrocarpa No.1 posts and exposed dummy rafters. Inside their is stained exposed beams out of Kingfisher SG8 and wide facings out of Kakapo Clears – all band sawn again. Our Timber Consultants worked in closely with a local Approved Reseller to come up with the unique solutions call for in the design specification. What a stunning result!